A member of the rose family, the Eriobotrya genus has Loquat as its only prominent species. 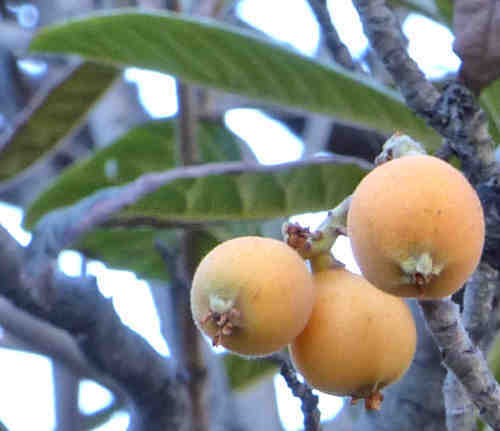 There are over 800 cultivars of Loquat found around the world, of which less than 30 are widely grown. 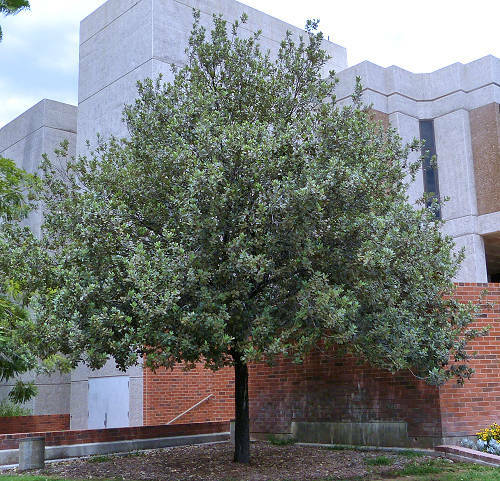 Form: A large shrub or small tree. Mature Size: 10-30' high and 8-25' wide. Flowers: White, fragrant, small, clustered at the ends of branches. Bloom: Fall to early winter. This tree tends to bloom heavily, then lightly, in alternate years. Pruning excess blooms in heavy years may help even out the blooming cycles. Self-fruitful: Depends on cultivar. All cultivars do better with a companion as a pollinator. Years before fruiting: Grafted 2-4, grown from seed 8-10. Fruit: Oval, round or pear-shaped, and 1-2" long. The skin is smooth or downy, and yellow to orange. The flesh is white, yellow or orange, sweet to sour, and contains 1-5 brown seeds. Months for fruit to ripen: 3. The fruit are ripe when slightly soft. Storage after harvest: The fruit of many cultivars must be consumed immediately, with the fruit of a few cultivars lasting up to two weeks when refrigerated. 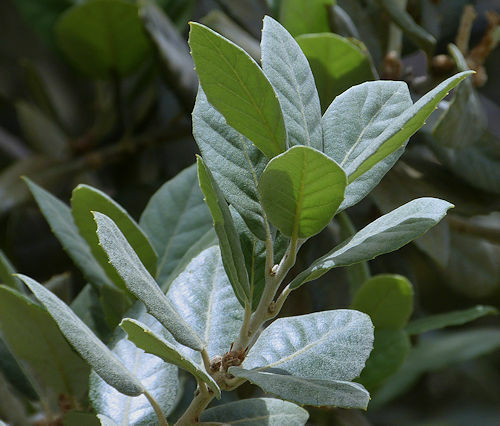 Leaves: Dark green, glossy on top, whitish or rusty-hairy beneath, thick, stiff, prominent veins, broadly elliptical to narrowly lance-shaped. Roots: Shallow. Most trees are grafted onto rootstock for quicker fruit production. 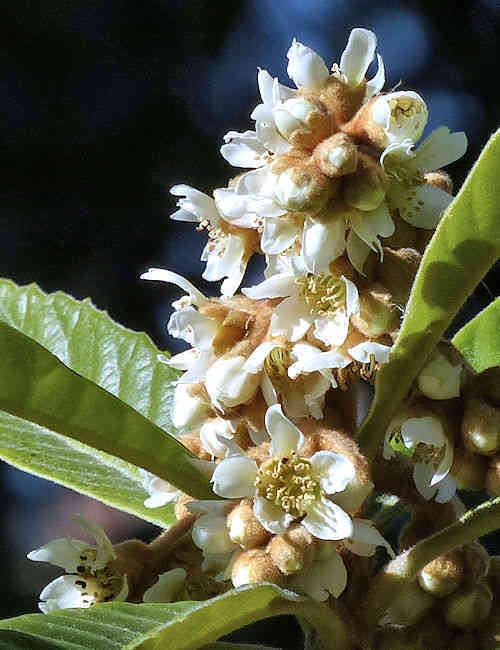 Any variety of loquat seedling is used as rootstock to produce a normal-sized tree. Quince rootstock is used to produce a dwarf variety. 'Big Jim' Large fruit, orange flesh, sweet-tart flavor, 2-4 seeds, skin easy to peel, oblong to round shape, self fertile. 'Champagne' Whitish flesh, sweet, spicy flavor, 2 seeds, thin skin, pear shape, self fertile. Wildlife: Attracts bees, birds and mammals. Toxic / Danger: All parts are mildly poisonous except ripe fruit. Origin: China. Introduced to Japan 2000 years ago. USDA hardiness zones: 8b-10. Temperatures below 26°F will kill flowers and fruit. Fruit-bearing loquats are best grown in citrus-producing regions and need some heat to mature a crop. Being subtropical, they prefer mild summers and winters and dislike freezing temperatures. Heat tolerant: Somewhat. Significant amounts of shade are needed in high temperatures. Sun: Full sun in the morning and afternoon part shade when temperatures are over 90°F. Young plants may need part shade all day in the hottest months until they are 8' high. Drought tolerant: Somewhat. Needs shade and water to cope in high heat. Water after becoming established: Deep water slowly once a week when fruiting, and do not flood. This tree is flood intolerant. When the plant is over four years old, water monthly when not fruiting. Avoid over-watering. Soil: Very well drained, saline-free, tolerant otherwise, this plant does better in pH 6.1-6.5 (slightly acidic), but tolerates pH 6.1-7.8 (slightly acidic to slightly alkaline). Fertilize: Use compost instead of chemical fertilizers in regions with alkaline soil. Loquats are sensitive to salt. Loquats are prone to magnesium and potassium deficiency in alkaline soil, and the symptoms resemble fire blight or salt burn. The application of magnesium sulfate and fish emulsion, diluted in water and poured around the drip line, has been found to be effective. Mulch: Use 4-6" under the canopy but one foot away from the trunk to reduce heat stress, water loss, and prevent weeds. Planting: Can be grown as an ornamental in large containers. The tree must be positioned on top of a mound if there is any danger of flooding. First Year Care: Water every other day for the first week. Water twice a week for the first couple of months. Water every week after that for the first year. Water every two weeks in the second and third years. Prune: Thin the fruit when they are marble-sized or smaller, leaving 4-6 fruits per terminal shoot. This will allow the fruit to grow larger and avoid branch breakage. Prune branches and stems just after harvest to reduce the number of terminal shoots, and to remove crossing branches. If the top of the tree does not receive full sun, prune to a low height to facilitate fruit thinning and harvest. Propagation: Seed is used for ornamentals, cuttings grafted onto rootstock are used for fruit production. Uses: Ornamental, edible fruit (fresh, fruit salad, pies, jams and jellies).